USTA Middle States is pleased to welcome Seth Pamperin as the newest member of its staff working in the Valley Forge office. As the Junior Development Coordinator, Seth will work with Michael Kennedy, Director of Junior Competition, to help grow junior tournaments. He will also help coordinate USTA Jr. Team Tennis with Meghan Goodwin, Competition Manager. Seth was born and raised in Menomonie, Wisconsin. He is a recent graduate of Carroll University (Waukesha, Wisc. ), with a degree in Recreational Management. Seth previously served as a tennis pro at the Maine Golf and Tennis Academy, the Milwaukee Tennis and Education Foundation, and was the Assistant Women’s Tennis Coach at Alverno College in Milwaukee, Wisc. 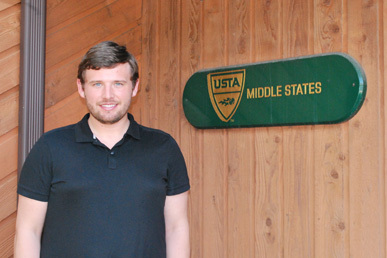 Prior to joining Middle States, Seth was USTA South Carolina’s Junior Competition Intern. He is also a former member of USTA Wisconsin’s Board of Directors, and was on the Tennis On Campus Committee at USTA Midwest. Seth’s dedication to promote, develop and service the game of tennis makes him a great fit at USTA Middle States.